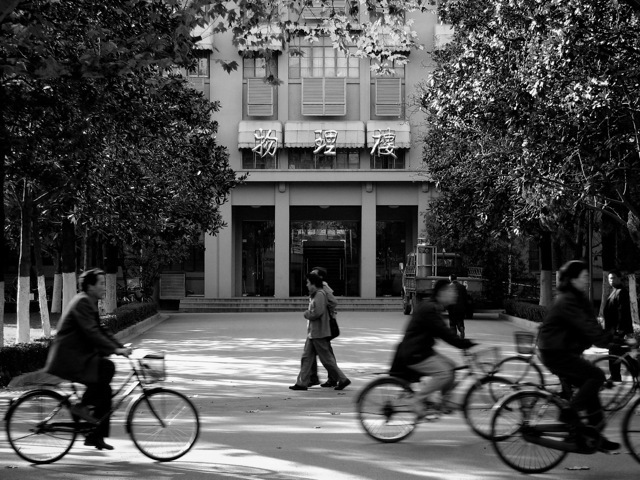 Back in 1998 I was leading a study abroad group to China, Nanjing University to be specific. We had been in the country for only two or three days. I was eating lunch in a small restaurant just off campus when I noticed three of my students enter. They didn’t see me, so I just observed what happened. They entered the restaurant and stood just inside the door. I knew what they were thinking—they were waiting for someone to greet them and show them to a table, just like in an American restaurant. They waited, and waited, and waited some more. I could see they were getting impatient and maybe a bit frustrated. I also observed the two waitresses working in the restaurant. They seemed equally perplexed. One said to the other, “What are they doing just standing there?” The other replied, “I don’t know, maybe waiting for someone.” What my students did not understand is that in small, informal restaurants like this you simply find an empty table without waiting for someone to show you. In other words, there is no host or hostess. 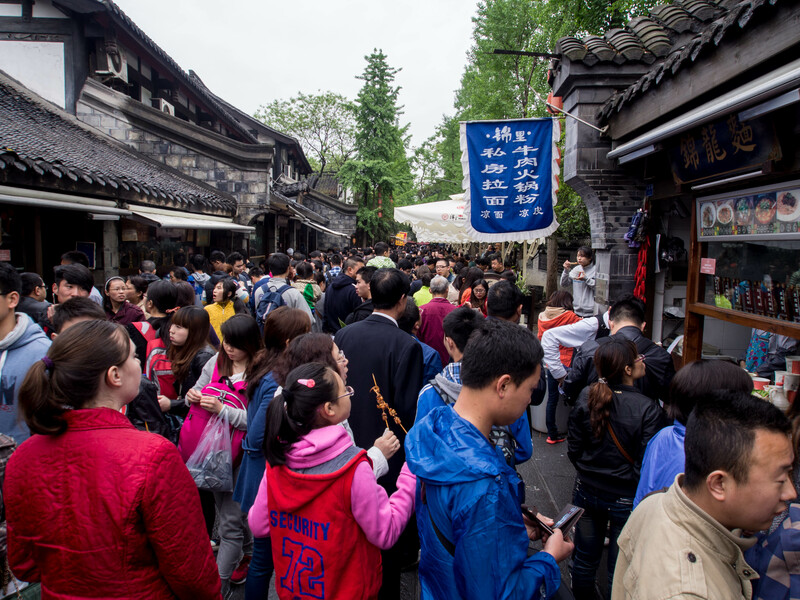 They assumed that eating in China was the same as eating in the U.S. These students had pretty good Chinese having studied at the University for 4 to 5 semesters. I knew they had the linguistic capacity to order a meal and do whatever else they needed in a restaurant. But they still didn’t know the “rules” or “codes” involved in eating at a restaurant in China. It’s not as simple as it may seem, even if you know some Chinese. 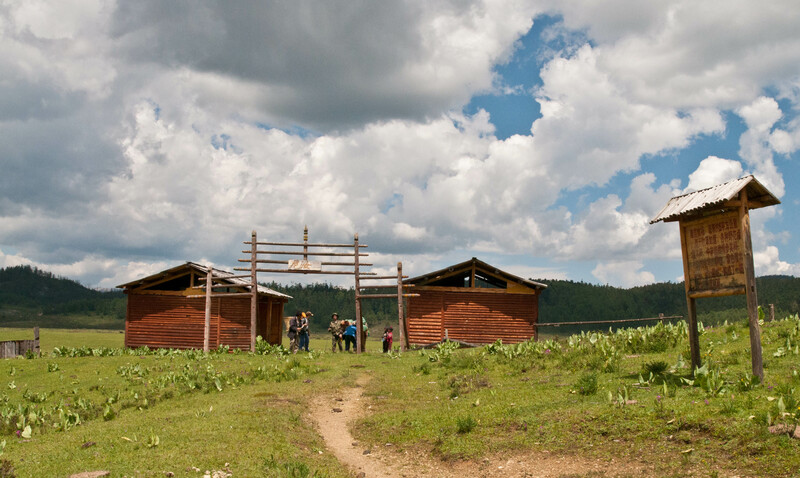 This experience impressed upon me the importance of cultural knowledge. To get things done in China requires a whole set of knowledge that goes far beyond linguistics. In fact, one could argue pretty persuasively that cultural knowledge will get you farther in China than linguistic knowledge alone. This book is the result of several years of research on how to get things done in China; how to make sense of the Chinese world; how to decode China so it makes sense for a foreigner. 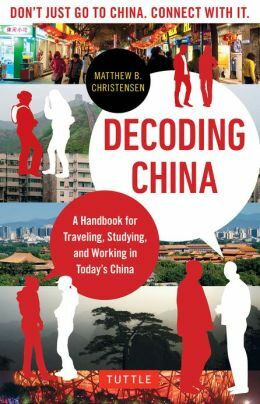 With that rather lengthy introduction, I am happy to announce that my book, Decoding China: A Handbook or Traveling, Studying, and Working in Today’s China is now available for pre-order. It is available through Amazon and Barnes and Noble and there are links on the right side of the main page of this blog under Books. It will be available in April. I think this book would be a great benefit to students going to China to study, students doing internships in China, people going to China to live and work, independent travelers in China, and even armchair travelers. It contains all the information I wish I had when I first started traveling to China. I think it will even be valuable for those who have been living in China, even for several years. Basically, this is a book for those that want to go beyond the tourist or typical expat level of understanding. This is a book for those who want to live, work, or study independently among the Chinese. It is for those who want to blend in, not stand out. Which train should I take? Deciphering the train class numbering system. Characteristics of hotels in China. How to make sense of a Chinese menu. 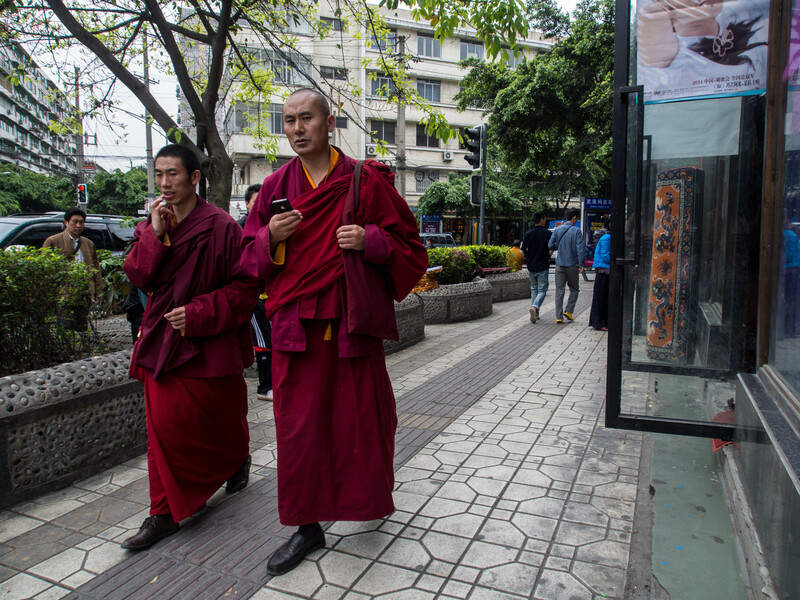 How to buy and make sense of cell phone plans in China. How to use the Chinese versions of Facebook and Twitter. How to open a bank account in China. 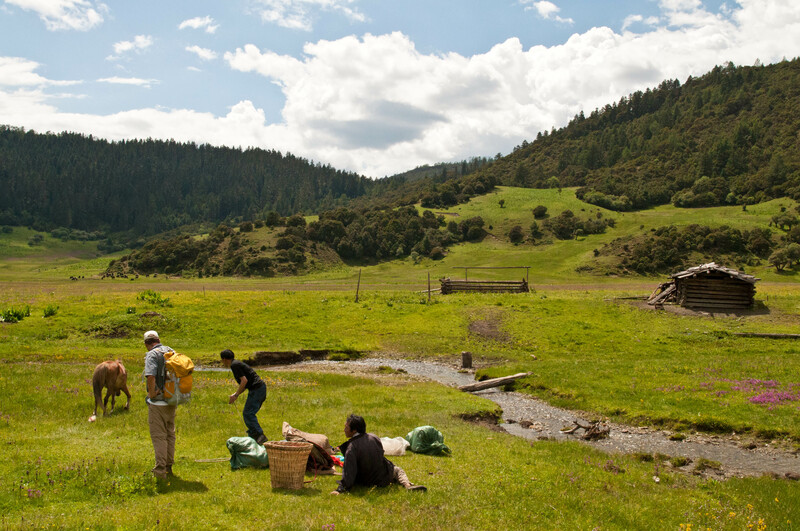 How to barter like a native. How to select a Chines study program. Making sense of Chinese “face” relations. The concept of guanxi explained. What kinds of gifts should you give. How to deal with culture shock. Strategies for staying healthy in China. Send me a message if you have any questions. After a pretty restful night at Mr. Tian’s guesthouse, we had a breakfast of instant noodles. We also spent time boiling water and filling our water bottles for the days’ trek. Mr. Tian was amused that we were bringing so much water. We each had about three liters in Platypus water bags. He told us the trek would be about 6-8 hours and we would be climbing up and over a more than 13,000 foot pass. As we were anxious to get going, Mr. Tian told us how to get to the bridge that crossed the river and where the trail began. He was getting his horse ready when we took off. We planned to wait for him and his party if we were not sure which way to go. The guesthouse was up on the side of the valley, so we had to wind down through the village to the river. The farmhouses were clustered together with fields of barley between them. 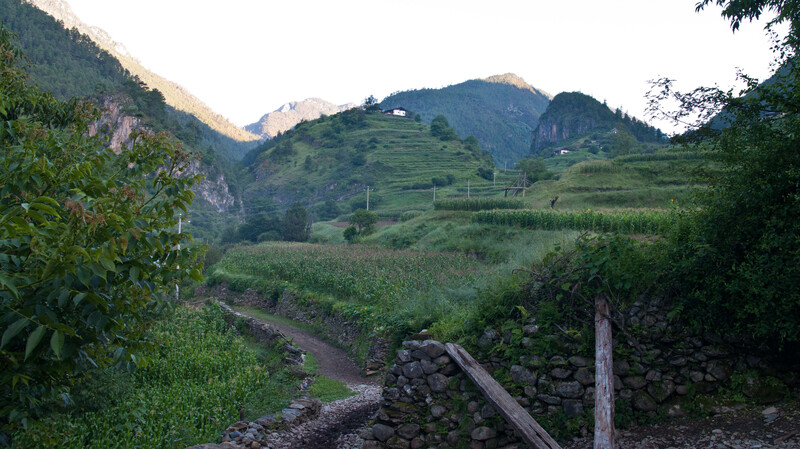 As the village was on the slopes of a mountain, many of the fields were terraced. 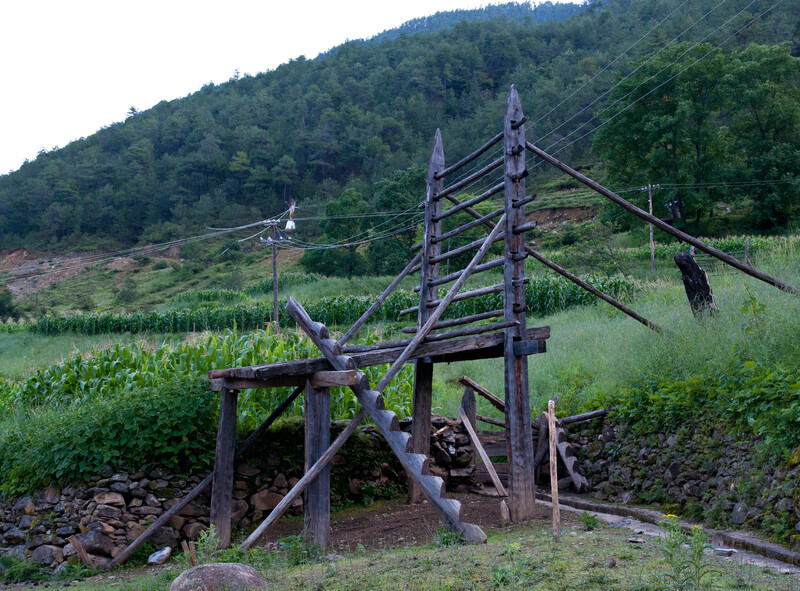 We passed several racks used for drying barley. 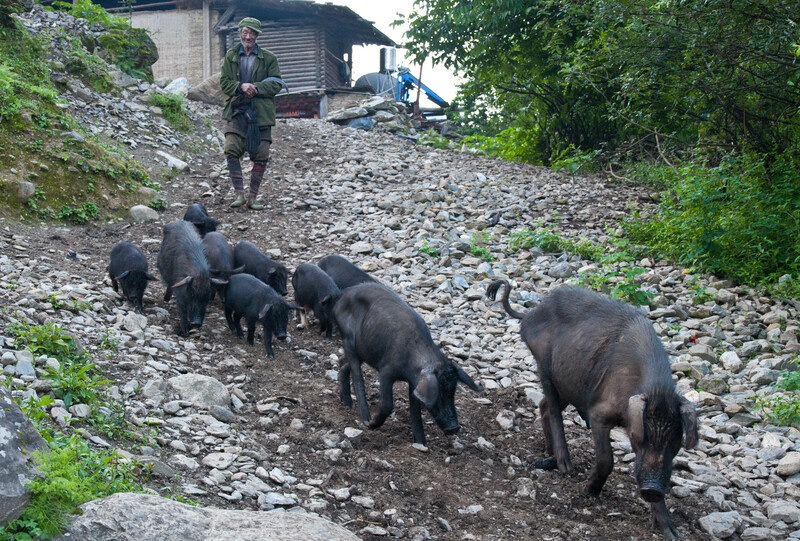 Along the way we met an old man taking his pigs out to the pasture for the day. He didn’t speak a word of Chinese, so there was not much communication other than some smiles and waves. 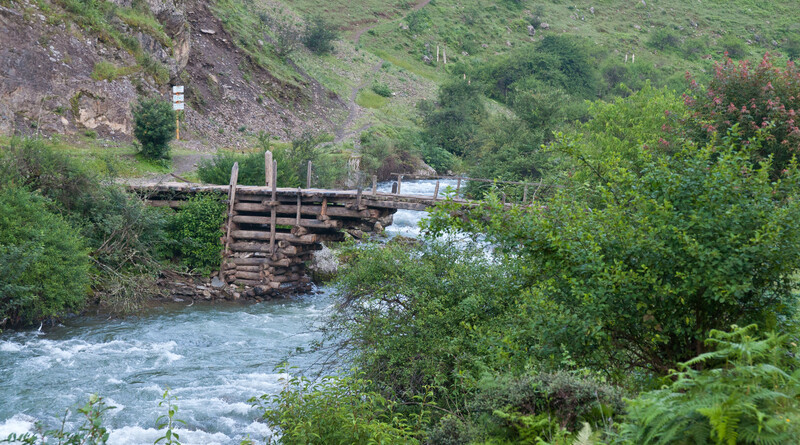 After winding our way through the farmhouses we found the bridge crossing the Niru River. 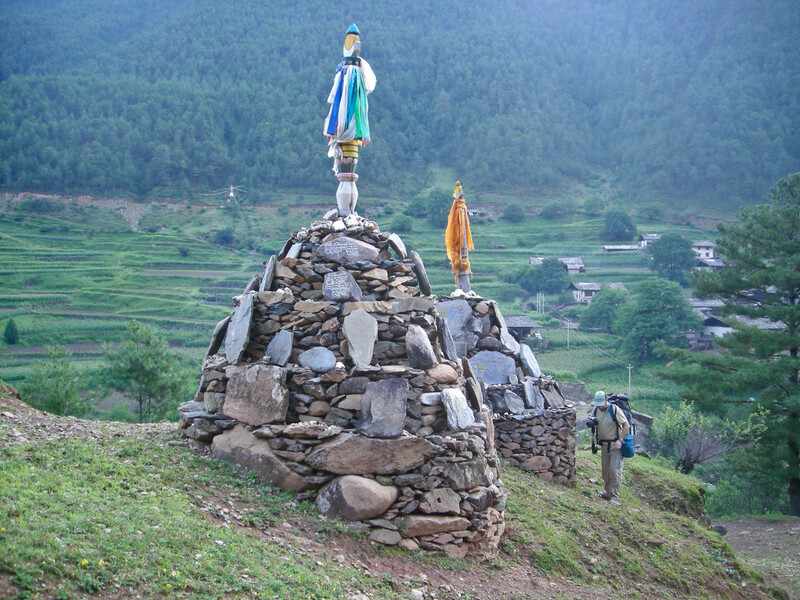 After crossing the bridge the trail passed two large piles of mani stones. We decided to take a break here and wait for Mr. Tian and his clients. Niru Village is in the background. While waiting, the old man with the pigs herded his pigs into a nearby pasture. After waiting for awhile, Mr. Tian and his clients showed up. 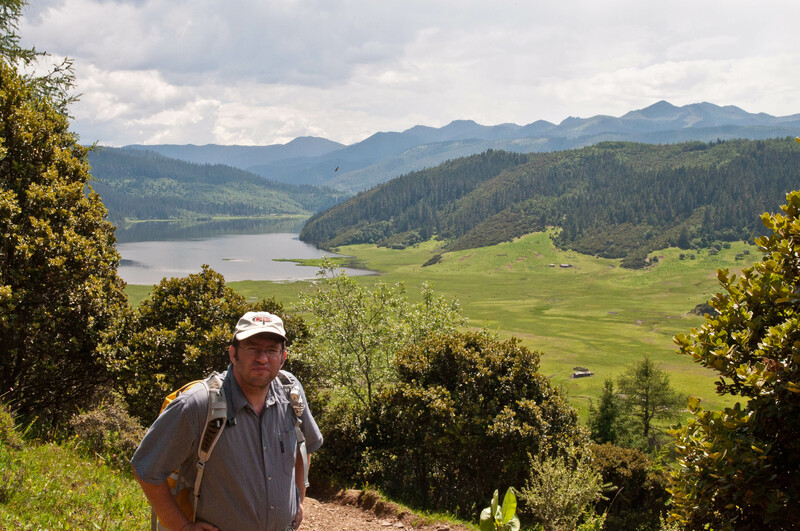 One was a young American guy from Brown University who was doing research on the economic effects of the National Park on Tibetan villages in the area. He had three young Chinese students with him that were serving as research assistants. I believe they were from Yunnan University. The American guy carried a large, cumbersome backpack, but the Chinese guys just had little day packs. The horse carried the rest of their gear. We chatted for a few minutes, then Michael and I took off. 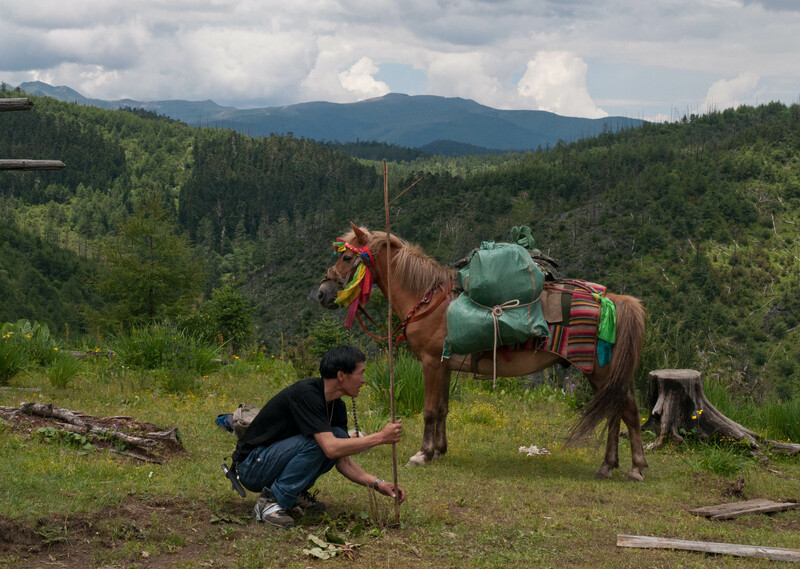 We found out very soon that even though the horse was carrying most of their things, they were hiking very slow. 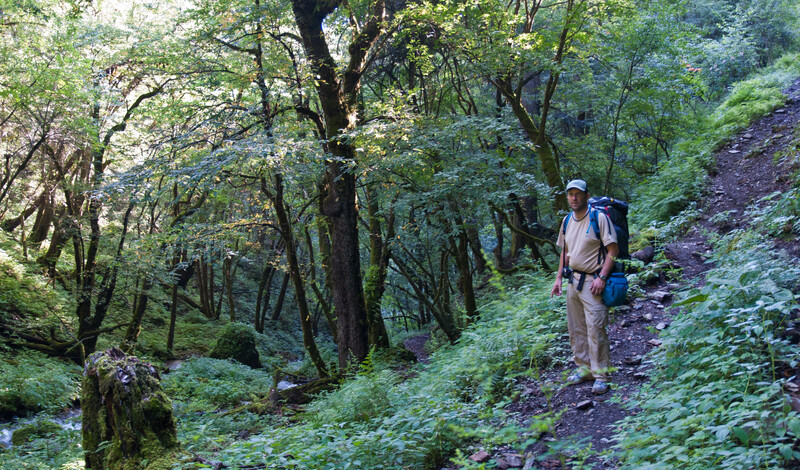 Michael and I are both experienced backpackers, so this was nothing new to us. The trail swithbacked up the side of the mountain for about 2 miles before turning into a side canyon. 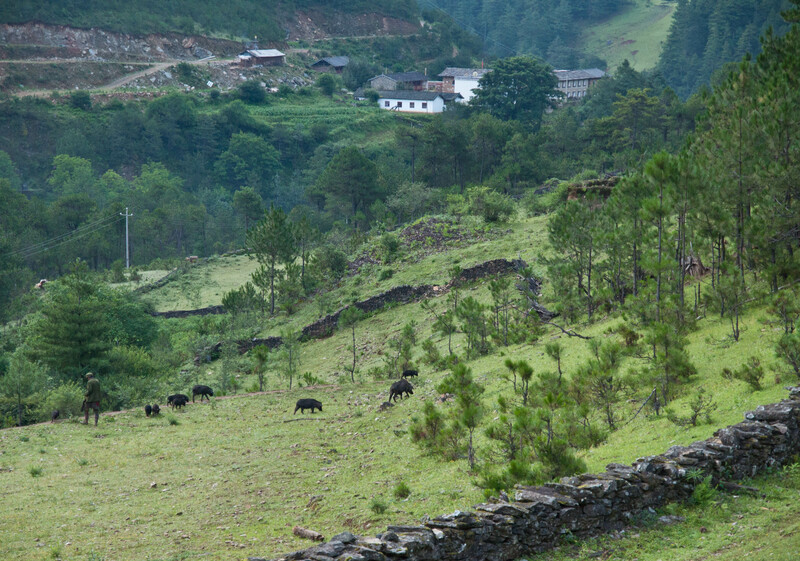 High up on the mountainside we had a good view of the Nanbao pastures across the valley. It would have been really nice to be able to hike up there, but that will have to wait for a future trip. The trail up this valley was green and lush. 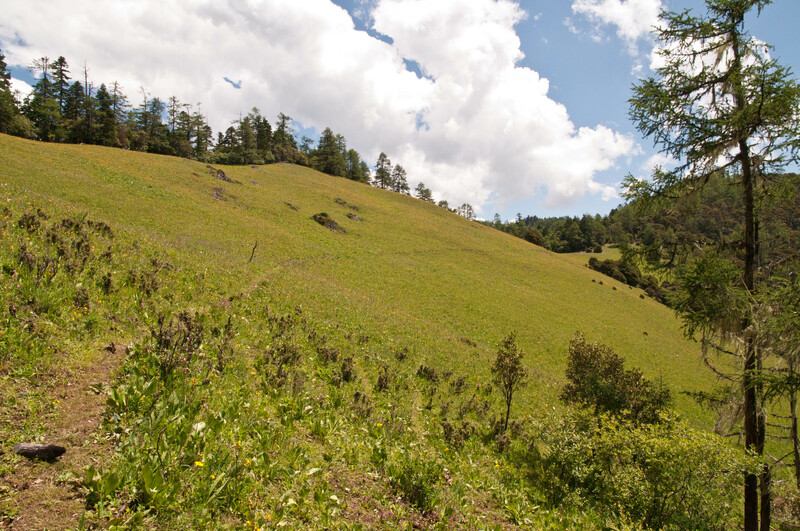 We knew we were headed up to a 13,000 foot pass, but we were having a hard time picturing it with all this lush greenery. 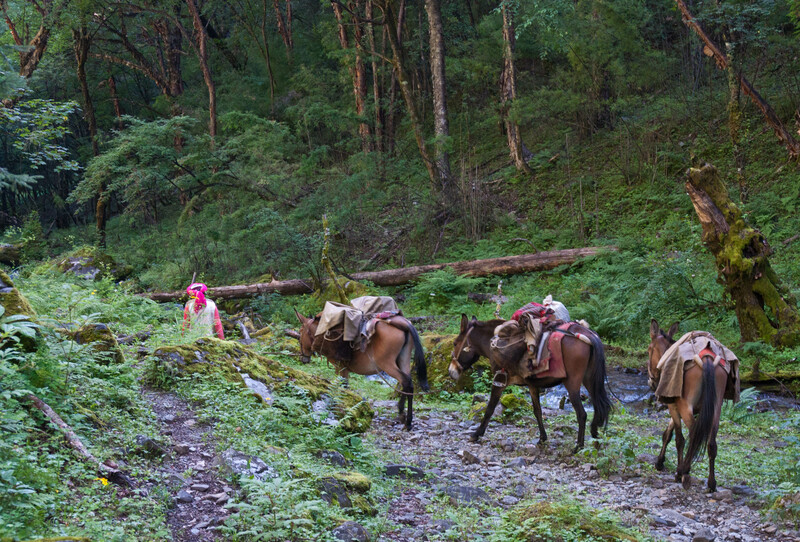 Occasionally a Tibetan with pack horses would pass us on the trail. In the Mountain West region of the United States where we live, anything above about 10,500 feet is rocky, barren, and devoid of almost all plant life. After a couple more miles we came to some small pastures. On the edge of one of these pastures was a log cabin, just like you might see out the Western United States from pioneer times. We decided to take a break here and wait for Mr. Tian and the others. There was a crudely written sign on the front of the cabin saying visitors were welcome to stay there. Mr. Tian later explained to us that there are similar cabins scattered throughout the mountains for yak herders to stay in when the weather turns bad. 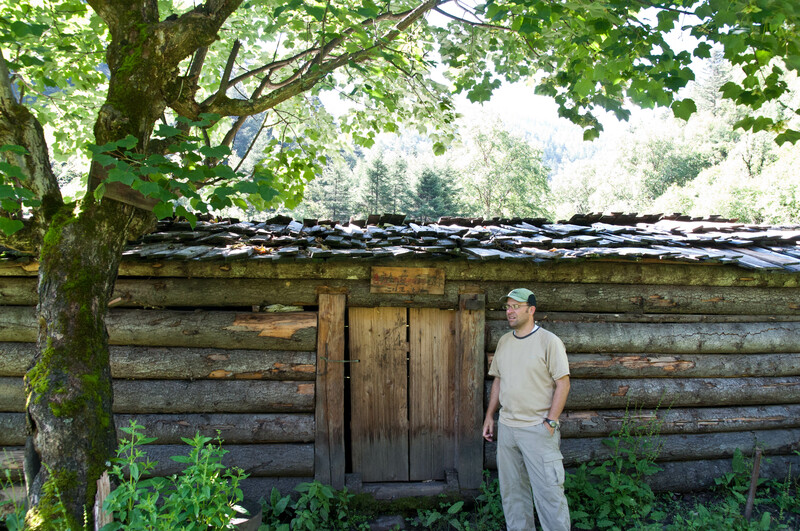 It did not look like the cabin would keep much out, but I suppose it would be better than being outside in a storm. The trail soon left the valley and began climbing steeper again. It switchbacked up a steep mountainside to another higher meadow area. Finally, after about five or six hours of hiking we arrived at the pass. 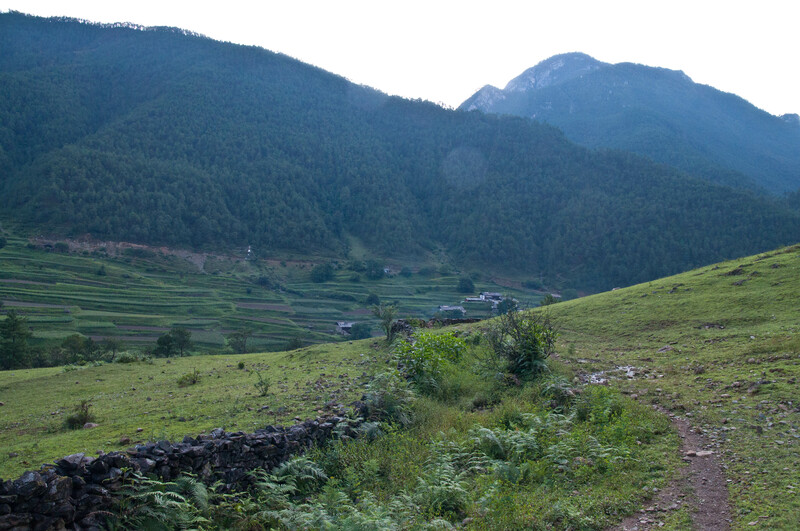 And we were very surprised to find it as lush and green as the surrounding valleys we had passed through earlier. 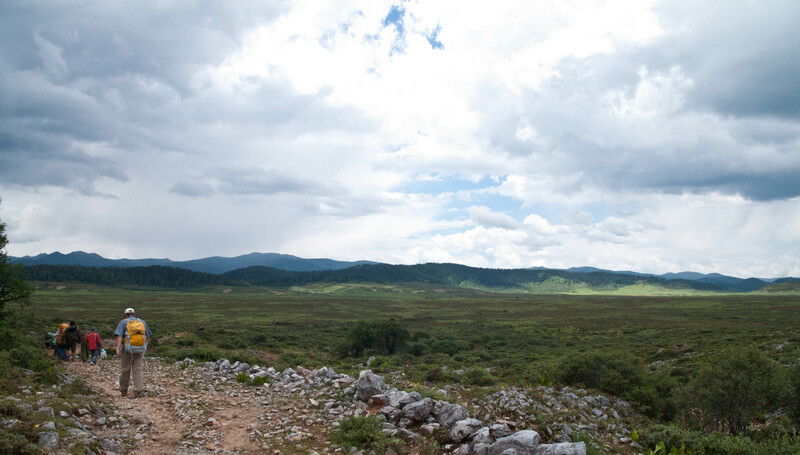 We later learned that in this area of Southwest China there are several long, deep river valleys that run South to North. Warm, moist air and storms from tropical Burma and further south keep these valleys wet and green. Burma was less than 75 miles from here. We rested here taking in the fine views. Mr. Tian spent some time digging for medicinal roots. Mr. Tian and the others were razzing us for carrying so much water. Ironically, about 2/3 the way up to the pass, they were all out of water, and sheepishly asked us for some fluids. We had a couple bottles of Chinese sports drink that we were able to share with them. Maybe that’s why they were so slow. 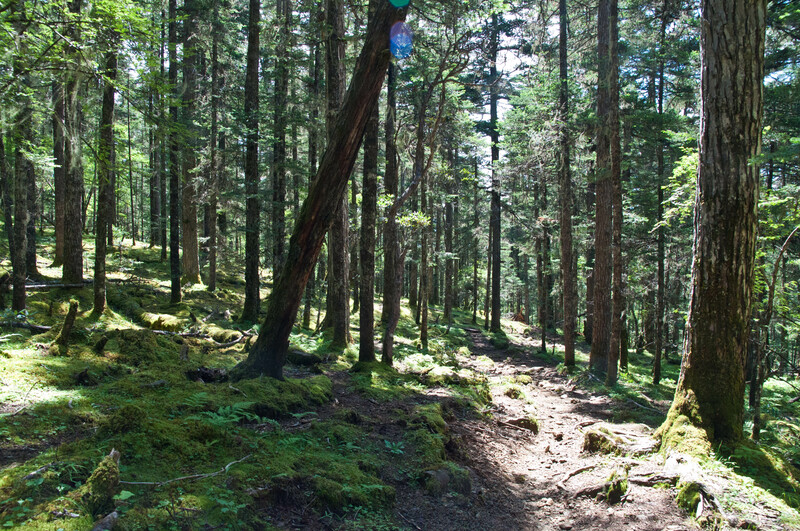 The trail descended quickly off the pass and back down into the forest. The lower we got the more yaks we began to see. Once we were out of the forest we could see an immense sea of pasture down below us. 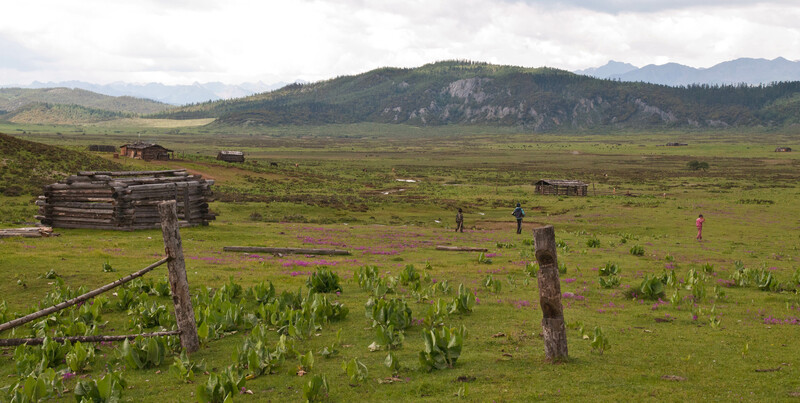 This was an important Winter pasture area for the Tibetan yak herders. The pasture was huge, stretching for miles in each direction. 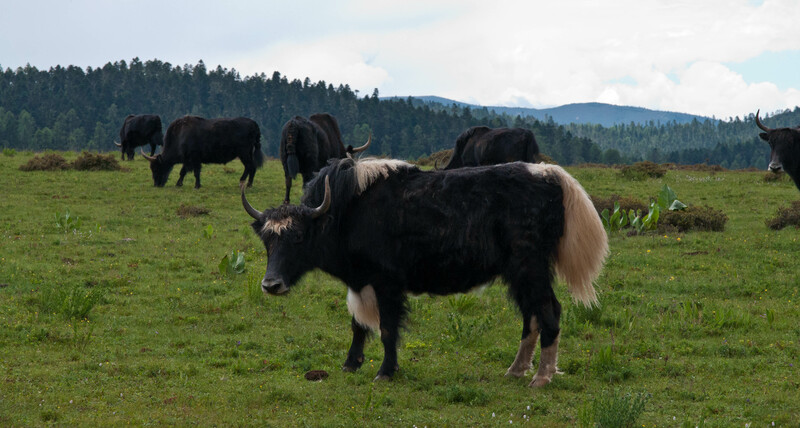 There were herds of yaks scattered all over the pasture. 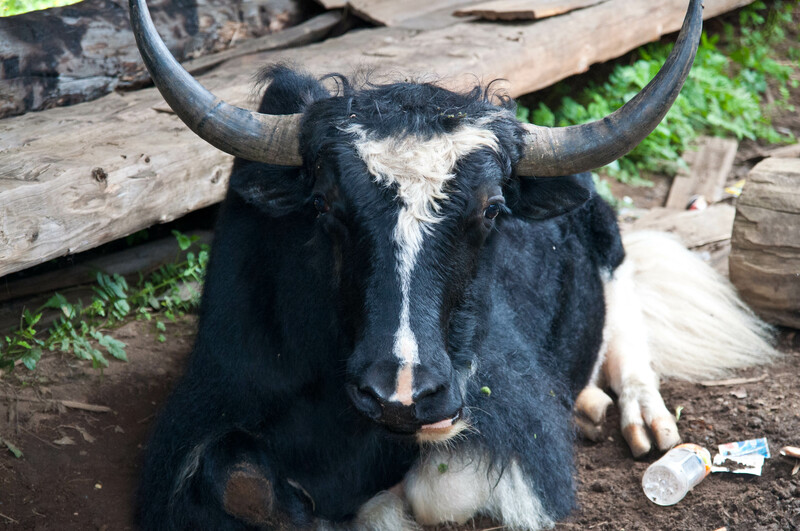 We learned from our Tibetan driver that most yaks are actually hybrids—a cross between cows and yaks. They seemed pretty docile, just watching us as we walked past. There were also more rustic cabins dotting the area. On the far side of the pasture we came to a couple log structures that looked like they were intended to be stores, but were deserted, and in a state of disrepair. It was obvious that they had never been used after being built. It seemed as if this area was gearing up for tourism, but the infrastructure was not there, and maybe the tourists had just not shown up yet. There were no roads into this area and anyone wanting to come would have to walk or ride a horse for at least half a day or more. 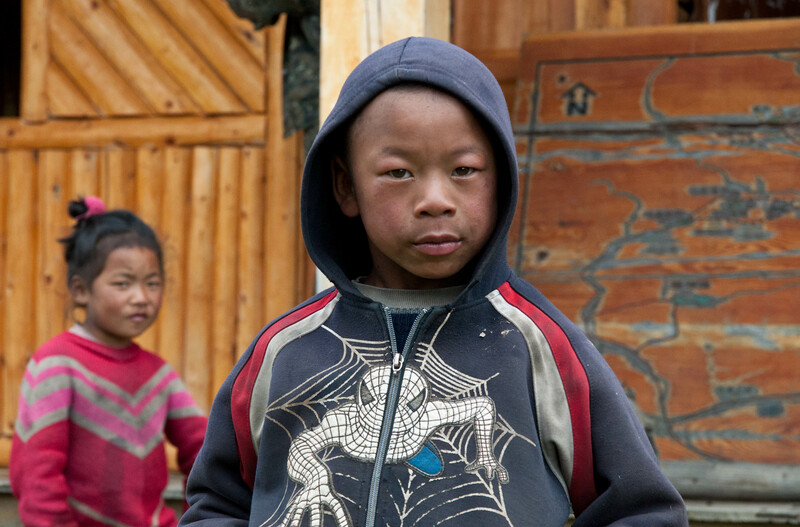 We asked a local Tibetan if there was anywhere we could buy something to drink. 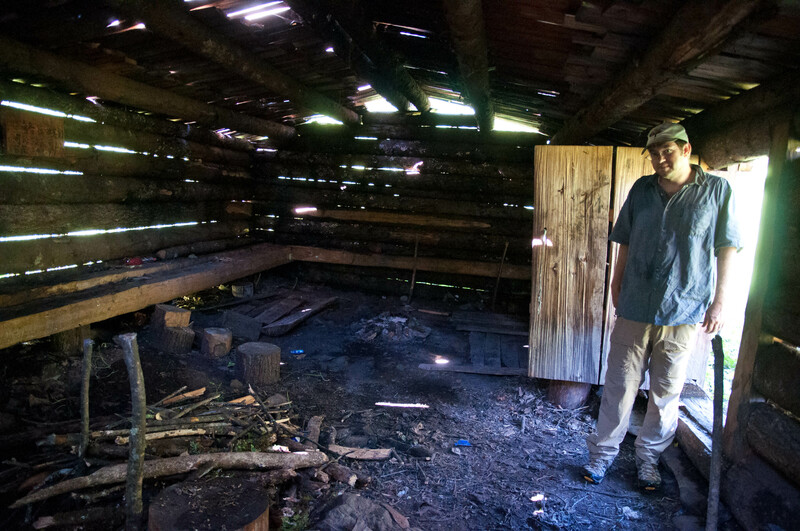 He pointed to a cabin a little ways off with smoke rising from it. 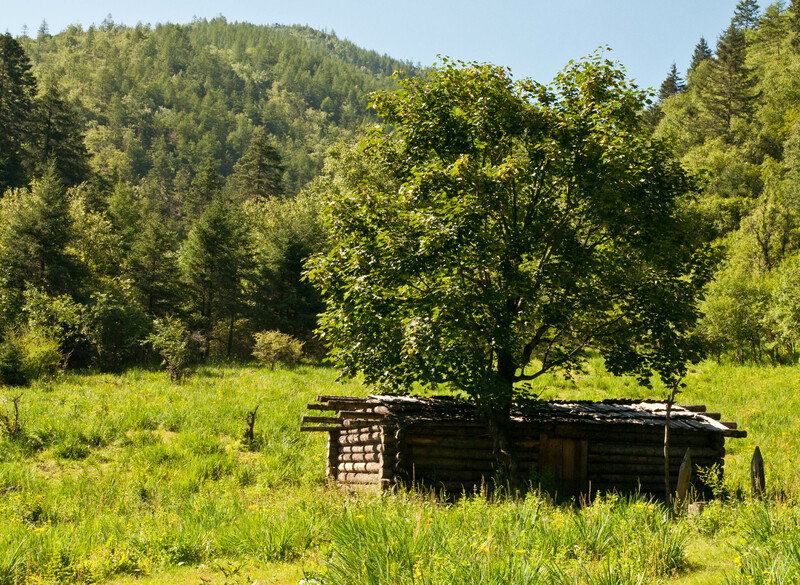 We walked over there and entered the cabin (Tibetans do not usually knock). Inside, the cabin was dark and smokey. There were three men and a woman sitting around the fire talking and laughing. The woman jumped up when we entered. Surprisingly, of all things she had for sale, she had cans of Pepsi. We each bought a can and went back out to the other cabins where our packs were. While resting there a couple Tibetan kids wandered over to see the foreigners. They didn’t say much. I don’t think they understood much Chinese, and our Tibetan was much better. After resting up for a short time, we continued on our way. It was getting late and Mr. Tian told us that there were tourist busses at Shudu Lake that could take us back to the National Park entrance. He believed that the last bus left at 4:00 pm. We really wanted to get on that bus, as we were really hungry now. For the whole day we had subsisted on some coconut cookies, some peanuts, water, and Pepsi. We wanted to get back to Shangri-la and a proper meal. The trail headed into a nice forest on the far side of the pasture, then began climbing again to a low pass. Once over the pass we could see the lake and pastureland below. We hiked pretty fast down the hillside to the marshy pastures below. We wanted to make sure we made that last bus. 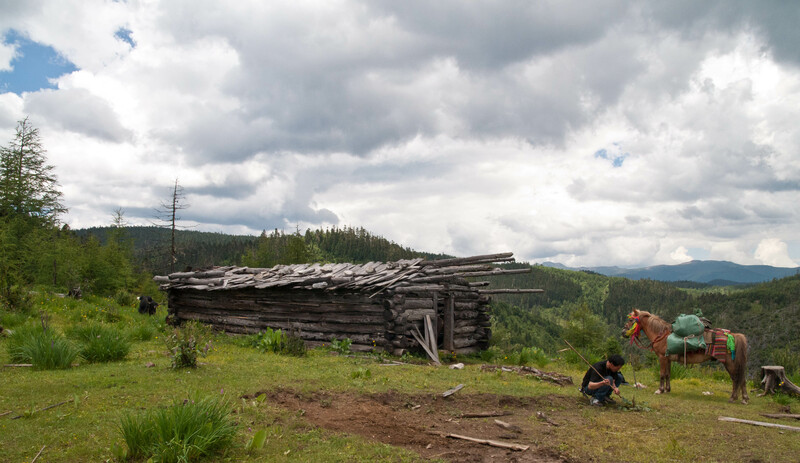 Once we got down to the pasture below, Mr. Tian unloaded his horse and began to set up camp. He was staying there for the night before returning to Niru the next morning. 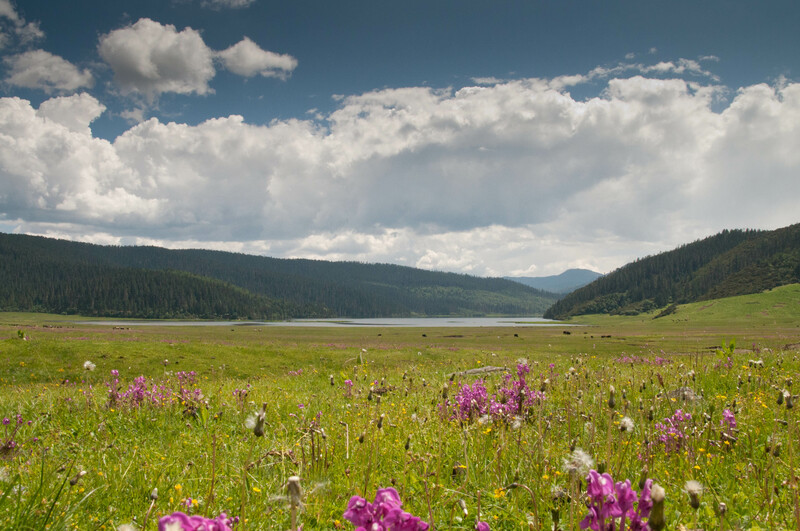 The pastures around the lake were full of wildflowers, Tibetan horses, and yaks. It was really wet as well. At times we would sink up past our ankles in the wet marshy grass. It was a really beautiful and tranquil place. We had a pow-wow and discussed if we could possibly stay there at the meadows for the night. We were also making some contingency plans if we missed the last bus and had to spend the night there. We had warm clothing, but no sleeping bags. We had travel sheets (like a thin cotton sleeping bag), but that would not provide much protection. We also did not have any food. We could certainly survive a night and there were plenty of empty cabins around. We vowed that if we ever returned we would have lightweight camping gear with us, and plenty of food. We would have loved to stay longer and explore the area, but it was not looking like that would be feasible. Our first priority was to head across the long, marshy pasture to the far side where there supposedly was a parking area and tour busses. The going was laborious as the ground was very wet. The grass was tall in places, and large, dense tufts of grass further slowed us down. The closer we got to the lake, the wetter the ground, but that was also the more direct route to where we needed to go. By the time we got across the pasture we were soaked from the knees down. There was a large parking area, restrooms, and a visitors center. Fortunately, there were also several large coach busses there waiting. We climbed aboard a bus, relieved that we made it in time. The American young man and his Chinese companions arrived a short time later. 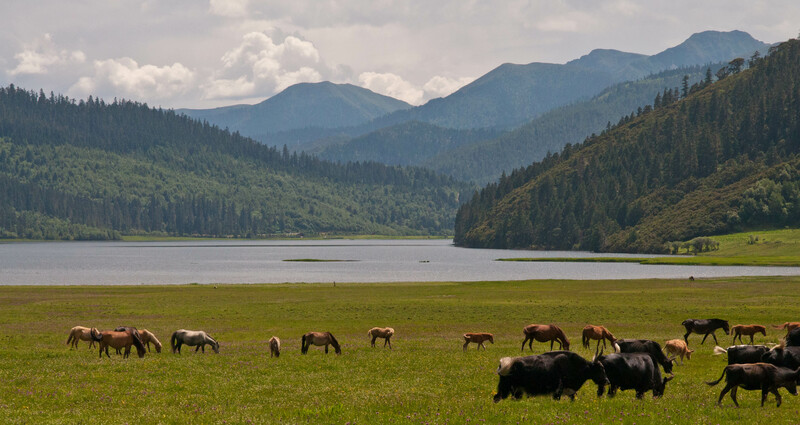 We learned that the way Chinese manage National Parks was quite different than what we were used to in the U.S. These large tour busses took tourists through the park, occasionally stopping at scenic areas where the tourists could get off and look around. Everyone then got back on the bus and rode to the next scenic spot. There were no camp grounds and no private cars. 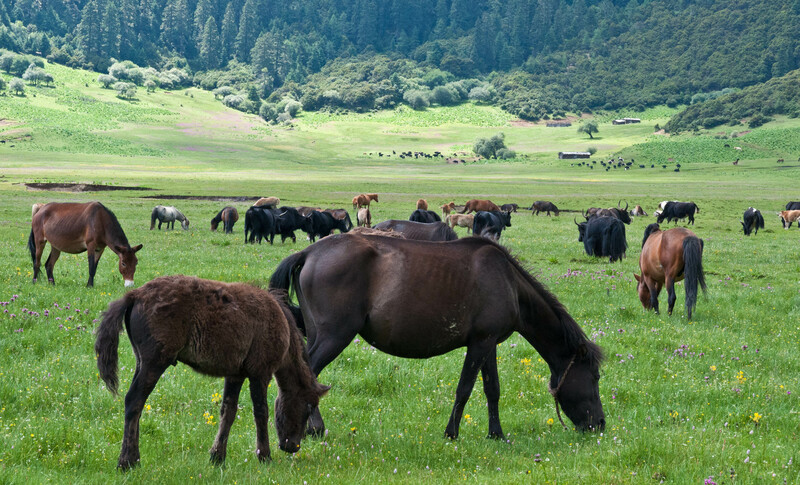 But were Tibetan camps around as this area has been an important yak grazing area for hundreds of years. When we arrived at the entrance to the park, we were met by park officials who demanded we pay the entrance fee, which we thought was pretty steep for what you got. We were actually hoping we could by-pass the fee as we had entered the park through the back way, but there was no persuading them. 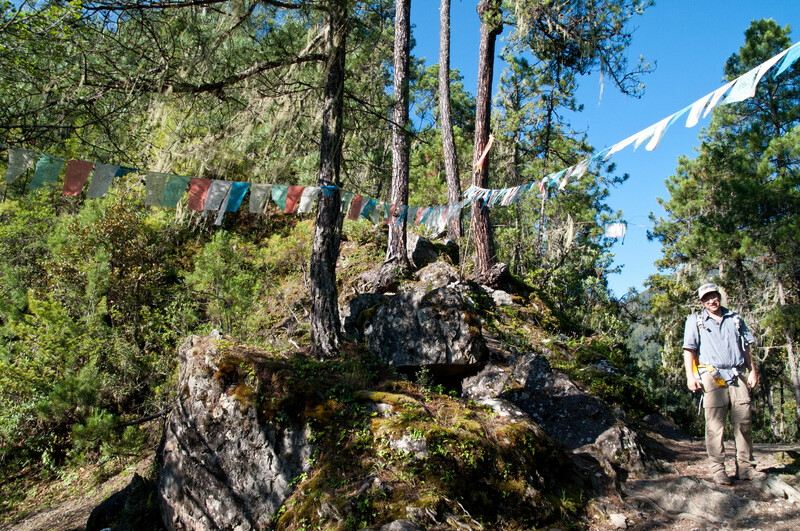 Getting back to Shangri-la was our next objective. Most all the busses were chartered for tourists and did not have room. We finally found a guy with a minivan who, for a price, agreed to take us to Shangri-la. It was about a two hour drive back to the city. 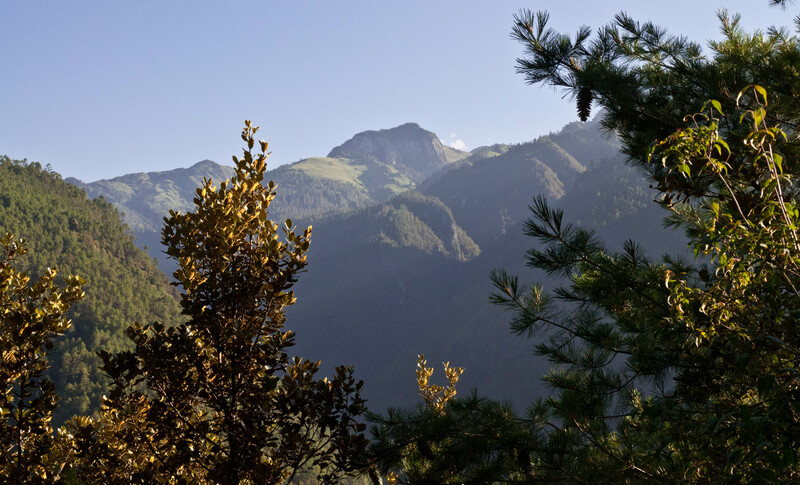 When we got back into town, we found a room at a small hotel, then headed to a nearby restaurant and had a large and satisfying meal of Chinese and Tibetan food. It was a very long day and the end of a very memorable trip. We have plans to return to the area but have not made any definite plans yet. Next time, we will be better prepared. I hope you have enjoyed reading about this adventure. And so on. There are quite a few resources out there but there is also a lot of junk as well. The internet has a wealth of resources but sometimes its hard wading through all the crap to find the good stuff. Below I outline some resources I have found to be useful. These kinds of programs allow one to read Chinese online by having an instant pop-up dictionary wherever you place your cursor. In other words, when you place your cursor over a character, the definition pops up in a window. This can make reading much faster. They are sometimes called text annotators. All three of these are quite powerful and have very good dictionaries. They are also fairly expensive, but sometimes you get what you pay for. Free programs that do much the same thing are around, but have some limitations. They include, Dimsum (which can be found at http://www.mandarintools.com), and the fairly new Google Chrome Zhongwen Pop up Chinese Dictionary. I have just recently started using the Chrome dictionary and it is pretty good. It allows you to have instant access to a Chinese dictionary when you are browsing a Chinese website. You can find it by going to the Chrome app store and searching for “zhongwen Chinese dictionary.” Firefox also has a free pop up dictionary as well. These free options do not have all the functions of the paid programs, but they are still pretty good. I personally use Wenlin in my own learning and teaching and the Chrome dictionary when I am browsing Chinese sites on the web. The best that I have found and use all the time is called Pleco (www.pleco.com). I would pay for the upgrade to be able to write characters with your finger for automatic look up. I’m amazed at how good this feature is, even if you have crummy penmanship. http://www.learningchineseonline.net is a clearinghouse of information with links to sites that offer all levels of resources for speaking, listening, reading, writing, proununciation, and just about anything else related to learning Chinese. http://www.chinesepod.com is a subscription based service that provides all levels of listening comprehension practice. I have known people that have used it and really like it. http://chinalinks.osu.edu has more Chinese related resources than any site I know. You can find information on everything from Chinese dialects, schools that teach Chinese, Chinese linguistics, learning Chinese, and everything else. Highly recommended. These are just a few, but the better resources out there, that can assist you in your Chinese language studies. If you know of other good resources, send them along in the comments section. Remember that learning a language like Chinese really is a life-long process. It is important that you know how to learn on your own and that you know how to use the resources effectively to continue your studies beyond the classroom. In a later post I will discuss specific self study strategies, like how to effectively use a tutor. A few posts ago I talked about terms of address. I’m afraid terms of address are quite complicated in Chinese. In fact, the complexity of the system is a direct reflection of hierarchy in Chinese society. That is, it is very important how you address an individual based on your relationship with them. If the person you are addressing is in a position above your own, you will address them differently than if they are in a position perceived as below your own. This is true for familial titles, or terms for your relatives as well. Basically, if a relative is older than you, you address them by their title. If they are younger than you, you can basically call them anything you want, from their given name to a nickname or anything else. For a detailed list of familial terms of address, see this website. Be warned that the list goes on for pages. In reality there are specific terms for just about every relationship you can imagine within an extended family. And the terms are different if you are addressing someone on your father’s side versus your mother’s side. It is incredibly complex. For example, last week I attended my nephew’s wedding, the son of my older brother. I was meeting with a Chinese colleague and wanted to tell him about it, but I first had to look up the term for “nephew” and not just any nephew, but the son of my brother, because the term is different if it is was my sister’s son. Even in immediate families it is common for younger siblings to address their older siblings by a title, such as 哥哥 gēge or 大哥 dàgē for older brothers, and 姐姐 jiějie or 大姐 dàjiě for older sisters. If you had more than one older brother of sister, you would refer to them in the order of their birth. For example, your oldest older brother would be 大哥 and the others would be 二哥 èrgē，三哥 sāngē and so on. Familiar terms are also used outside the family, even with people you do not know, such as with people that work in stores, restaurants, train stations, or friends of family members, such as your parents friends. For example, children will often address adults with terms like 大哥 or 大姐 for young adults, and older individuals with terms like 叔叔 shūshu (uncle) or 阿姨 āyí (auntie). 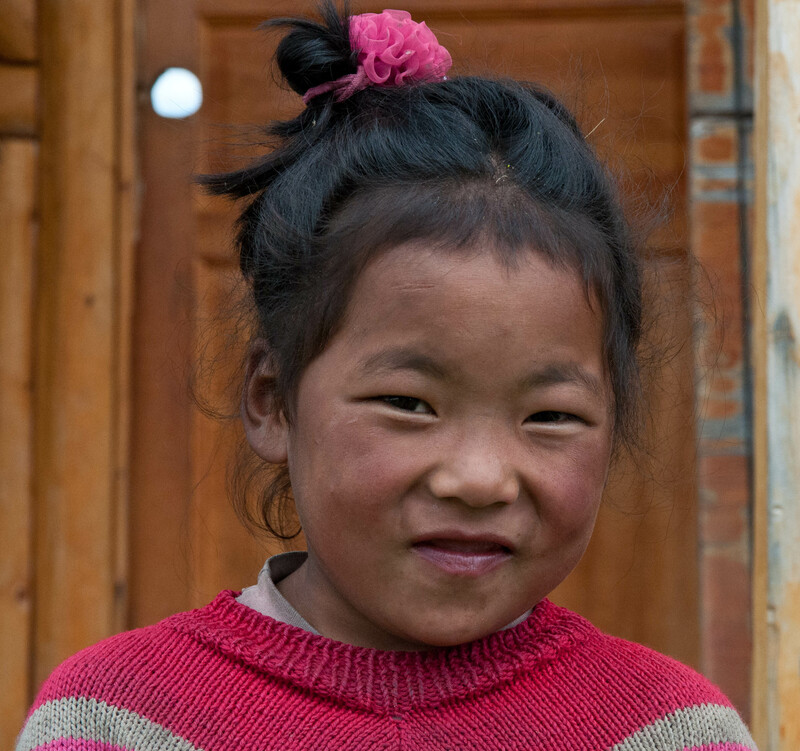 In Northeastern China, the term 大妹子 dà meìzi can also be used for a young woman. 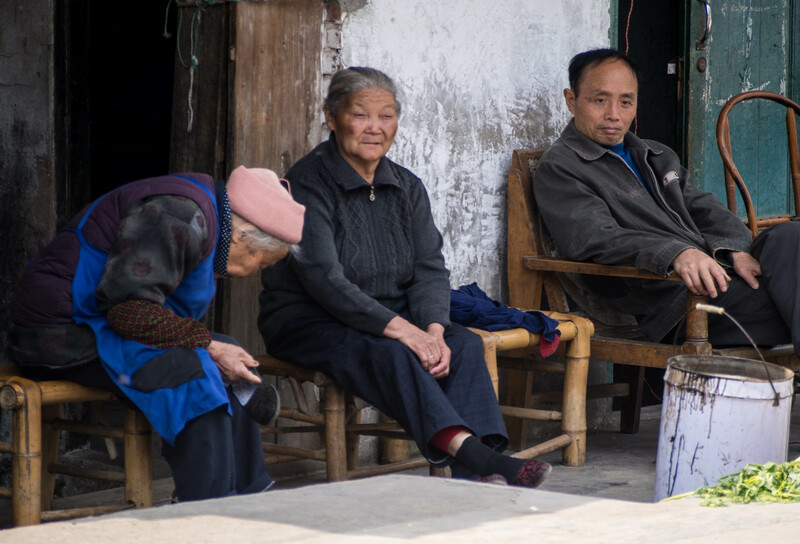 For very old people, one can use the terms 大叔 dàshū or 大爷 dàyě for someone really old, or for women, 阿姨 or for a very old woman, 奶奶 nǎinai. It is not necessary to memorize all the familiar terms. In fact, even native Chinese get confused and don’t know all the proper terms for all their extended relatives. A common way to address a child, whether male or female is 小朋友 xiǎo péngyǒu（literally “little friend”). 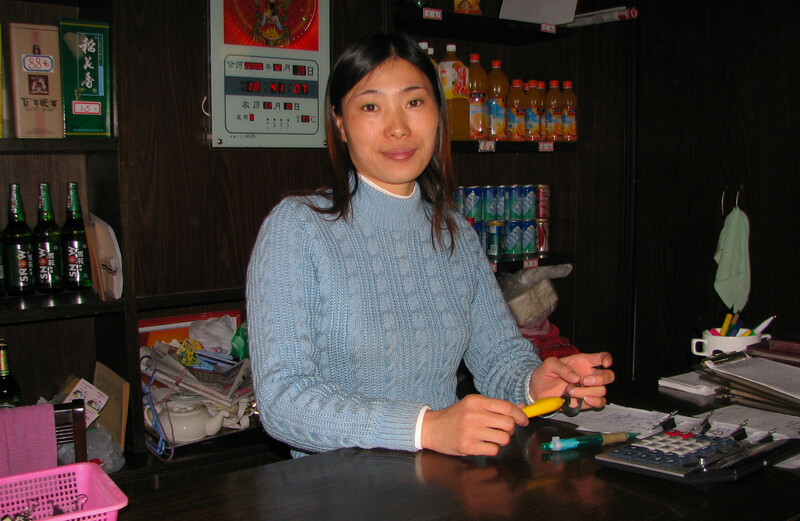 A fairly common term used to address people in the service industry, or those considered skilled workers or experts, such as drivers, coaches, and so on, is 师傅 shīfu. This term means “master” but is used beyond that specific meaning. If you take the time to learn how to address people in China it will go a long way in showing respect to those with whom you associate. It will also make those with whom you communicate feel comfortable, especially when dealing with a foreigner. Remember that the goal is for people to feel comfortable communicating with you, for you to communicate the way Chinese expect people to communicate. How do you address someone in China? This may seem like a rather simple question, but it is important, and differs from how we address people in the US. In China, hierarchy is an important part of social interactions. That is, who you are and your position in relation to others determines to a large extent how you address them. This is why, in China, that individuals will always exchange business cards when first meet so they know how to address each other. Terms of address, or how you address someone, depends on your level of familiarity with the person and the formality of the occasion. Below I describe various ways to address people. Unlike in the US, it is very common to address a person by their full name. It does not sound strange at all. Even people that know each other well, may address each other by their full names if they are in a more formal setting. Husbands and wives will even use their full names with each other when they are in public. This term of address is common in the workplace among colleagues, as well as at school with Chinese classmates. You will most likely use these two terms of address with the vast majority of your Chinese contacts. You have to know someone pretty well to be on a first name basis. This is quite different from the US where you can meet someone for the very first time and refer to them by their given or first name. In China it takes quite a long time to get to the familiarity level to call someone by their given name. This term of address is reserved for in-group individuals, such as friends, classmates, and co-workers that have a similar social status as you. A Chinese associate of mine explained to me that her nickname among her friends growing up was 老五 lǎowǔ. This name came about because she had four close girlfriends and she was the youngest. In Northern Mandarin 老 lǎo refers to the youngest member of a group. Since she was the youngest of the five, they used this nickname. You could also use this term for a relative. For example, if you had three uncles, you might refer to the youngest as 老舅lǎojiù or your youngest aunt as 老姨 lǎoyí. Some nicknames are terms of endearment, and are often a variation of a person’s name and are called 昵称 nìchēng in Chinese. I had a friend who was a bit older than her group of friends so they gave her the nickname, 姐姐 jiějie, “older sister” and called her 冯姐姐 féng jiějie（her surname was Feng). Another friend was named 吴小琪 wú xiǎoqí and her parents and grandparents called her 琪琪 qíqí. You are quite safe addressing Chinese with surname + title or by their full name. Be careful about using given names or nicknames. Relationships in China form and develop much slower than in the US and it may take quite a bit of time to get on those very familiar terms with someone. One final note: in the US you will undoubtedly meet Chinese who will introduce themselves with their given name, either their Chinese given name or an English name. What do you call them? The rule I generally use, is that if you are speaking Chinese with them, I go by the Chinese practice of calling them by their surname and title or by their full name. If you are speaking English with them, and they have an English name, go ahead and use the English name. If they do not have an English name, I am uncomfortable calling most Chinese by their given name, even if we are speaking English.